Hockney references not only his own experiences but observations drawn from advertising and the shock to the system of arriving in New York at the start of the 1960s. Though Hockney travelled from London, where he’d been living as a student for a couple of years, the scale and pace of New York must have come as a shock to the system and it’s evident from the series that he embraced the challenge of a new culture. In Plate 3 the reference to the door opening for a blonde for instance tells of Hockney dyeing his hair blonde – presumably to look more fashionable, in much the same way as Hogarth’s Rakewell dons fashionable clothes – while also referring to a Clairol advertising campaign of the time. 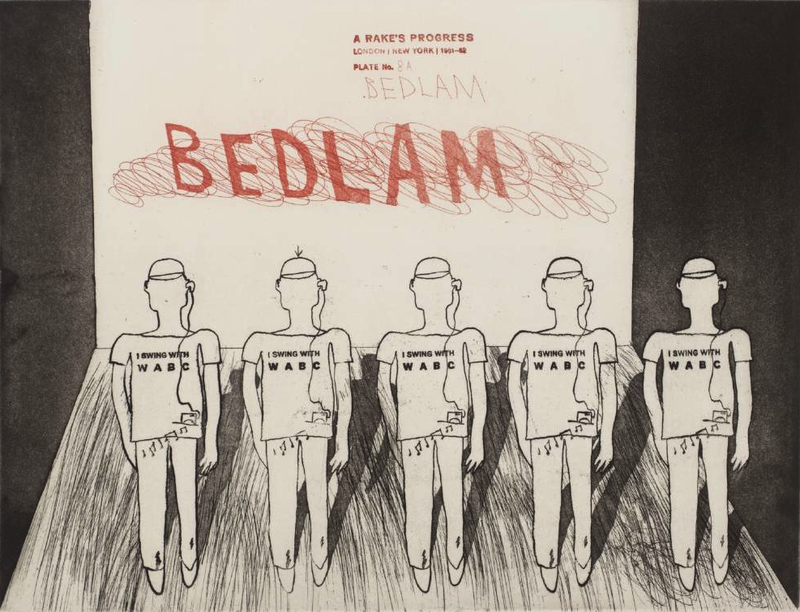 Hockney’s vision of Bedlam is of identikit people all plugged in to the same radio station, WADC. I think one of the main pleasures of this work for me is the way that it can be read as a narrative or unpicked further to reveal more about the time in which it was made. 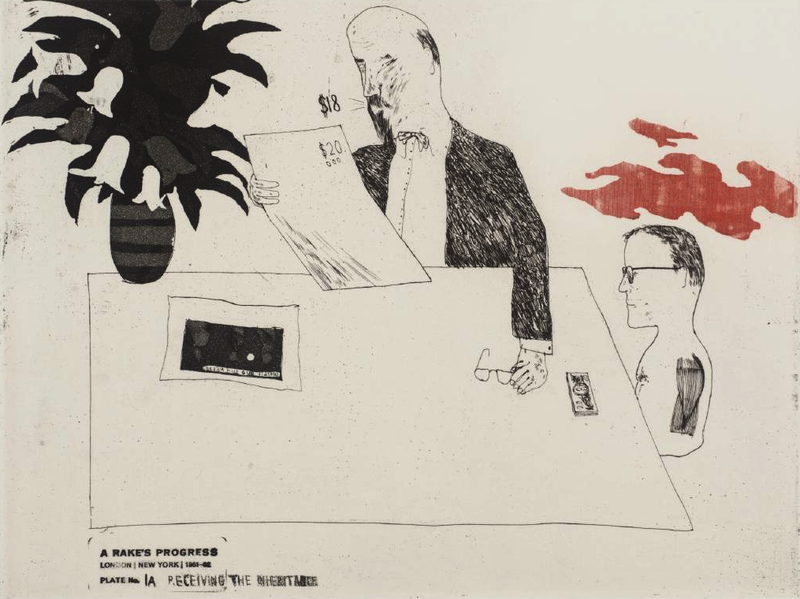 The way Hockney has made his own experiences fit broadly into Hogarth’s narrative reveals a lot not only about the life of a promising young artist at the start of his career in a time of immense social and cultural change but also about Hockney’s wit. This is a work that becomes more entertaining the more one engages with it. Over the intervening half century, Hockney has made work in different styles drawing on a wide range of subject matter – as his exhibition at the Royal Academy earlier this year amply demonstrated, and for my money, mostly not in a good way – but, for me at least, it’s the work from the start of his career, and in particular the work he made while at the RCA that is the strongest, and perhaps the most subversive. 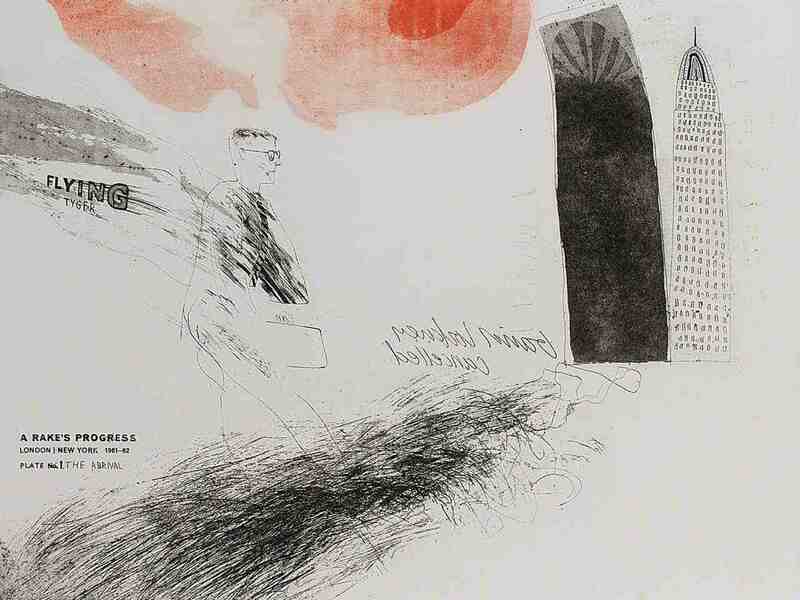 David Hockney: A Rake’s Progress is currently on display at Abbot Hall Art Gallery in Kendal, Cumbria [thanks to John Pindar for the info]. The series is also in the Tate Collection but not currently on display, although it is possible to arrange to see prints and drawings by appointment. 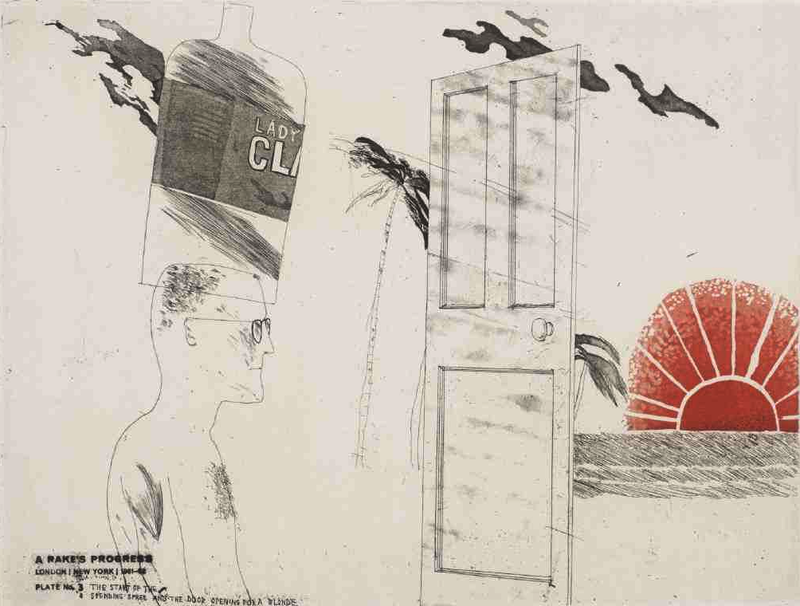 This entry was posted in Identity, Printmaking and tagged A Rake's Progress, art, David Hockney, etching, Hogarth, printmaking, The Rake's Progress by Ann Jones. Bookmark the permalink. Thanks for the mention. I was only introduced to Abbot Hall fairly recently by Down By Dougie, another blogger.